We can actually change our own brain. When our anger is triggered, it can turn into rage very quickly. When we feel rage, we are no longer in wise mind and all logic is gone. This is when we cause ourselves problems. 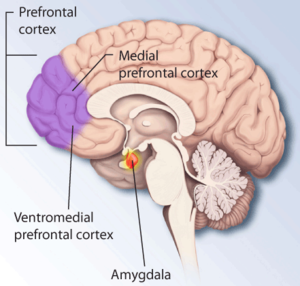 Our amygdala, the emotional part of our brain that assesses whether we are safe or in danger, responds within 50 milliseconds- that is quicker than the blink of an eye. Our prefrontal cortex– the part of our brain that plans, reasons, and holds our attention responds about ten times slower. Years and years ago this helped us survive. If we got thrown out of the cave and we were being chased by a wild animal, we would be up and running before we even had time to think. But in today’s world, responding off of pure emotion often causes us a lot of problems. When our brain senses threat, whether it is real or imaged, we automatically go into this fight or flight response without thinking. Many times our brain perceives threat when we are not actually in danger and it overreacts. This is usually when we say and do things that we later regret. This weekend I attended an excellent workshop taught by Dr. Marsha Lucas who is a neuropsychologist, a psychotherapist, and author of the book, Rewire Your Brain for Love. Dr. Lucas has done some amazing research and her findings are very exciting. We can indeed rewire our brain. By practicing certain mindful exercises for only five minutes everyday, we retrain our brain to pause when our extreme emotions are triggered. Research on the brain shows that these exercises not only change the way in which we react to stimuli, but they also change the brain’s actual physical appearance. Our mental practices create new pathways in our brain. We can train our brain to pause before our amygdala responds off of pure emotion without reasoning things through. In my post, It is All About the Pause, I have written about inserting a pause between a triggering event and our reaction, but I know have a clearer picture about the way the brain changes in the process. By practicing mindfulness, that 50 millisecond space will automatically become a longer pause giving you time to reason before reacting. Mindfulness is about being present in the moment and focusing on what is happening within your body in the here and now. Below I have given you a five-minute mindful exercise. Focus only on your body. Where do you feel tension? Start with your head and work your way down to your toes, relaxing every part of your body. Then begin to focus on your breathing. Notice the air coming in and out of your mouth. If your mind begins to wander, bring it back to your breath without judging yourself. Then gently open your eyes. Five minutes everyday. That’s it. With lots of practice, you will eventually find yourself much less explosive when your anger is triggered. The connections in your brain will change and you will be able to better control your reactions. Remember practice makes progress not perfection. While practicing mindfulness, you must be patient and treat yourself with compassion. Warning: People with a history of trauma should not practice mindfulness without consulting a mental health professional. For information about rewiring your brain for healthier relationships, check out Dr. Marsha Lucas at www.rewireyourbrainforlove.com. Yes, the science behind the psychology. Thanks Stuart! It is right up my street! Thank you for sharing it. I am enjoying your book! I’m glad – did you start at the beginning or on the date you received it? On the date I received it. I’ve seen my sister in a “red mist” situation. I think she would have blown up, irrespective of how much pre-training she’d received. She could not remember any of the events afterwards. Sounds like she may have been reacting to current or past trauma. I hope that she has seen a professional to help her with the “red mist.” Thank you for commenting. Awesome article Kristin… I am surely gonna try this. 🙂 Thanks for sharing this. Very Nice well invited post. More precisely and aptly written. Thanks for sharing this. I have benefited from mindfulness meditation myself and would certainly recommend it. “The power of the pause” and using breathing and body scan meditations to reduce tension and stop the negative automatic thoughts, the NATS, spiralling out of control was a revelation to me. I like the fact that mindfulness seems to marry up the spirituality of Buddhism with the rigour of Western Medical Scientific Research to bring about its enormous benefits. So well said, Corinne! Thank you. I see the best results when one can focus on the the breath long enough to let thoughts fade, while we have crystal clear awareness. The body and mind repair and strengthens itself. Learning that thoughts are a golf ball while our true self, right brain is the Pacific Ocean. Applying these skills when emotional thought arises is great advice. MIT can become habit and change where we focus our attention. Great article. neuroscience has explained what happens when we meditate. Yes,neuroscience has explained what happens when we meditate. Great to hear from you! It’s all about self-control and how to maintain it. Good exercise for anger control. Anneli- thank you. Happy Monday! Yes, I heard Tara talk about tend and befriend a lot this weekend. Have you read Tara’s newest book, True Refuge? She spoke about it. I think it will be good! Thank you for reblogging. Will give this a try, thanks for the suggestions! No problem, Brain. Always great to hear from you! Another great post Kristin. I have been heading down this path for some time and I can see changes forming. I think I am too impatient, I want to be completely different yesterday lol, and I am well practiced in being hard on my self. Learning self compassion is another element I am adding into my daily practice (Though I forget so much of the time) Practice makes progress! Love it! Blessings to you! “When practicing mindfulness, you must be patient and treat yourself with compassion.” — I think that is the major reason mindfulness works. How we treat our selves reflects in how we treat others. Patience is my lesson this year, as well as compassion. It must be true that charity should start at home. When I treat my self better, I will treat others better. Thanks for this Kristin. I have been an angry person since I was a child and this helps with my healing. I have also reblogged this at pearlsofthought.wordpress.com. Hope you don’t mind. No, I don’t mind. Thank you for sharing it with your readers. I am glad that you found it helpful. Again, you nailed it! “Responding off of pure emotion” another sentence so many need to reread! Breaking things down into simple ideas makes me think about it deeper. Thanks for sharing some of your tips about rewiring! I am going to try it! Hi Kristin, thanks for sharing this. I am doing some research into mindfulness practice for children/education. There seems to be a growing interest in this area in current trending media. I work with ADHD kids and have a strategy where we “press the pause” by actually tapping center of our forehead & breathing. I also use this saying throughout my work & with respect to reading. If you have any recommendations for books (youth friendly as well) I’d love your input! Thank you so much for commenting. I think there is such a need for more mindfulness training in children. I love your “press the pause” button technique! We are seeing more and more literature and books on mindfulness, but very little written for children. I will let you know if I come across some kid friendly books on this subject. Teaching children to pause before they react and to become aware of what they are thinking and how they are feeling is so important, especially children who tend to be impulsive. Teaching children that they do not have to act on their feelings in also important. In other words, it is alright to feel angry. It is not alright to start hitting someone because you feel angry. Keep up the good work.